A call for help from a rural sheriff’s deputy takes Fennimore to Oklahoma; a welcome distraction, until he discovers the circumstances – a mother is dead, her child gone – and they’re not the only ones. How many more young mothers have been killed, how many children are unaccounted for? Back in St Louis, the cold case team discovers a pattern: victims – all single moms – dumped along a 600 mile stretch of Interstate-44. The Oklahoma and St Louis investigations converge, uncovering serial murders across two continents and two decades. Meanwhile, nine-year-old Red, adventuring in Oklahoma’s backwoods, has no clue that he and his mom are in the killer’s sights – but soon the race is on to find a serial killer and save the boy. 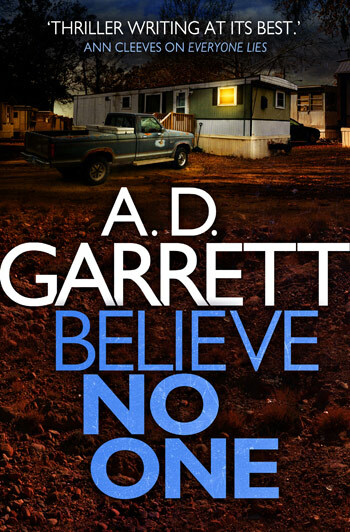 BELIEVE NO ONE is the gripping sequel to EVERYONE LIES.